National Commission for Scheduled Tribes (NCST) has written to the Department of Personnel and Training to ensure that the committee constituted by Government departments to investigate any matter requiring penalty on employees belonging to Scheduled Tribes community should have minimum of two members from ST community. The commission has taken this decision to ensure natural justice to every ST employee. As per the communication of the commission, if ST Officers are not available in the Department or Ministry than ST Officers from other Departments may be included in the committee. The NCST is authorized as per article 338 of the constitution to ensure proper service conditions to ST employees of the Government. 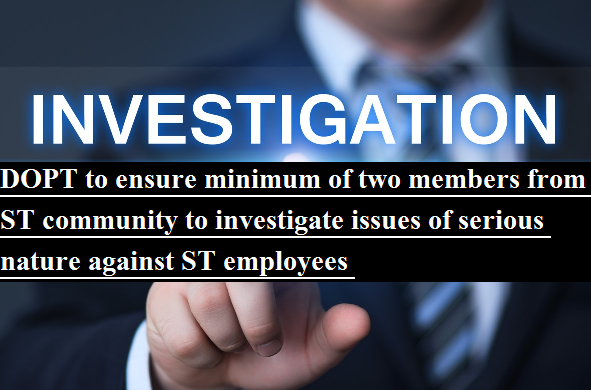 On many occasions it was found that normal procedures prescribed for disciplinary action against ST employees are not followed.